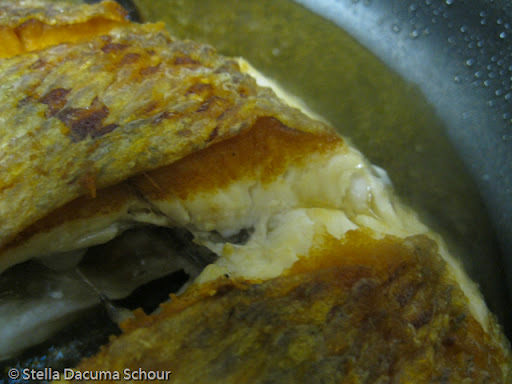 Growing up in Manila (Philippines), fried fish is usually on the dinner table. I loved having fried fish for dinner because this means that I can douse my rice pink with banana ketchup. As a child, I didn’t know what fish sticks are, and I first learned about fish fillet from McDonald’s Fillet O’Fish Sandwich. It is a bit burned, I know. Knowing how to debone fish at the dinner table is one of the best eating skills I learned. 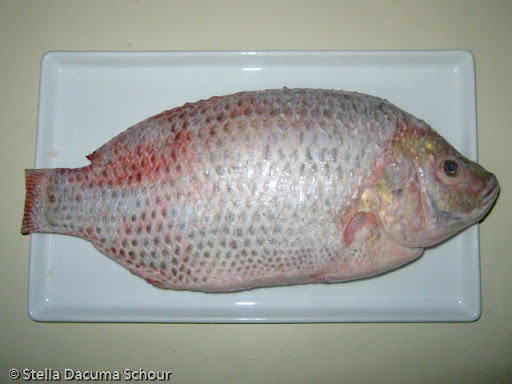 I get looks from fellow diners whenever I suggest ordering a whole fish dish at an Asian restaurant. I googled and surprisingly enough for me, it was a topic of conversation on Chowhound. I am so handsomely fresh! 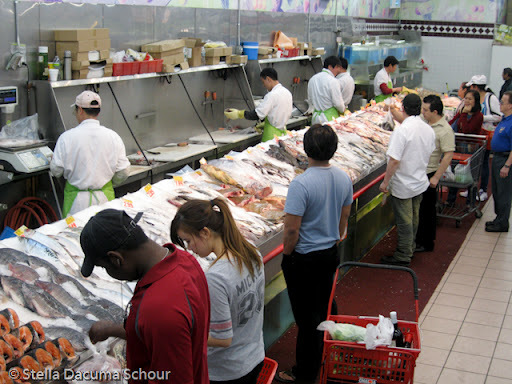 I always buy fish from the Asian supermarket. 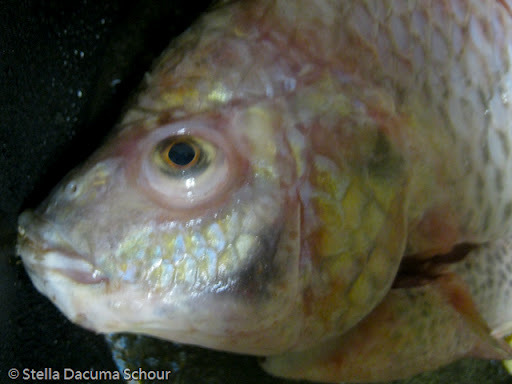 When buying fish, make sure the eyes are not red and they look healthy. The flesh should also spring back when you poke it. This particular one squirmed after I poked it. Sold! 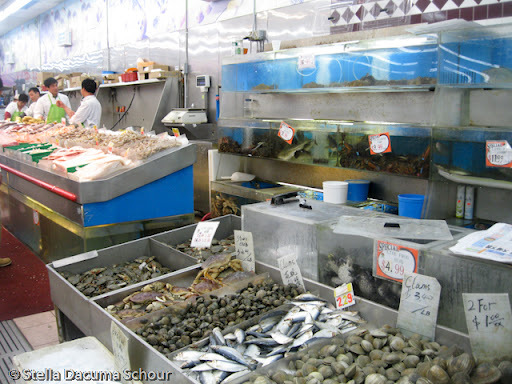 Fish in Asian supermarkets are always fresh because WE LOVE FISH! These guys in the green apron will clean and gut your fish. Fish minus the styrofoam packaging? FRESH PRIDE! Picky about freshness? Live fish and lobster is available too! Imitating a mermaid centerfold pose. Rock Salt – iodized is fine as well. Clean and rinse your fish again. Make sure you have no part of the guts left in the cavity. 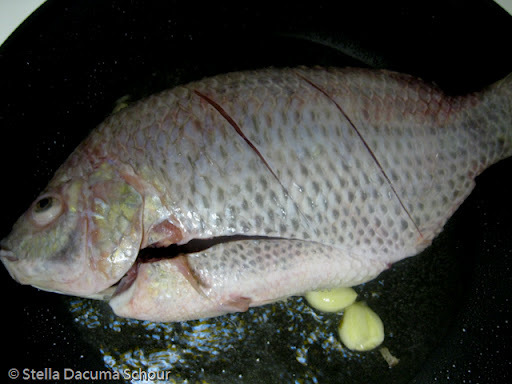 Cut slits on the side of the fish and put a very light sprinkling of salt all over, including the inside of the cavity. The slits allow the fish to cook inside. Heat the cooking oil on your frying pan on medium high heat. 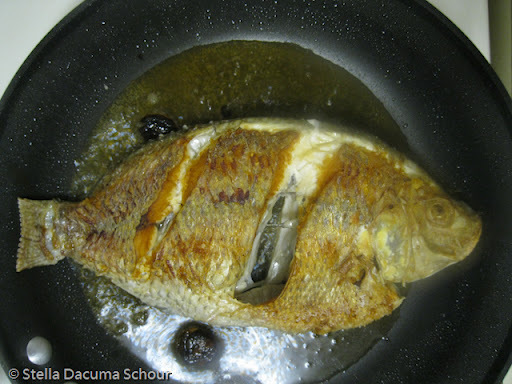 Don’t waste olive oil for frying fish. Flick a little bit of water in the oil. If it violently goes out, it is hot enough. Gently but quickly put the fish down in the oil. DON’T THROW IT IN THE PAN. You don’t want to burn yourself. Put the garlic in as you fry. Leave it alone. The garlic helps in giving the crispy brown coating. Turn the heat down to medium low heat. You want the insides to cook before burning the skin. You will know the fish is ready to turn after the frying cackling sound goes down and the fish is easily released from the bottom of the pan. After flipping the fish, flip your garlic too. Fried Golden Brown. The slits open up the fish. Crispy on the outside, flaky on the inside. Yummy all around. This is entirely up to you. When I was a kid, I loved banana ketchup. I doused banana ketchup on my rice to make it turn pink. different from the Kikkoman Soy Sauce made in US. 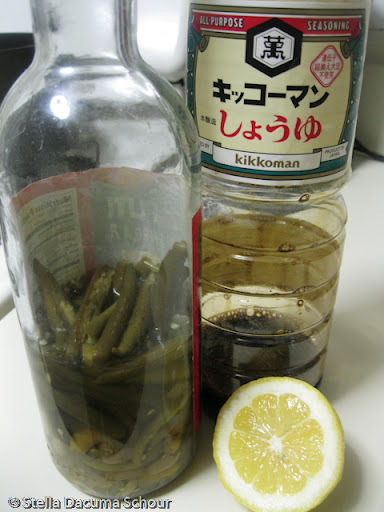 but Kikkoman has looked like this back in the 80s. When bottled water was not common. I was feeling very traditional so I made some lemon-soy-vinegar. I keep three kinds of vinegar on hand: Balsamic, Regular White/Cane Vinegar and Spicy Vinegar. 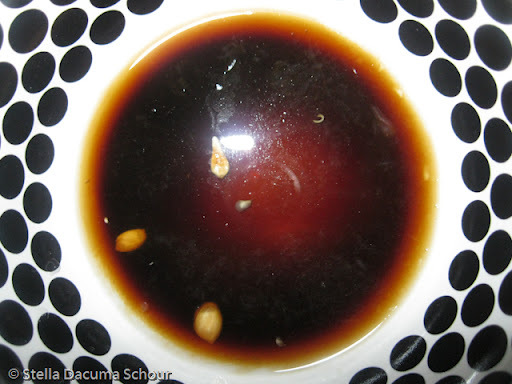 Start mixing one teaspoon of vinegar and soy sauce. Add whichever needs more, then squeeze some lemon. Blue – This is the Main skeleton. 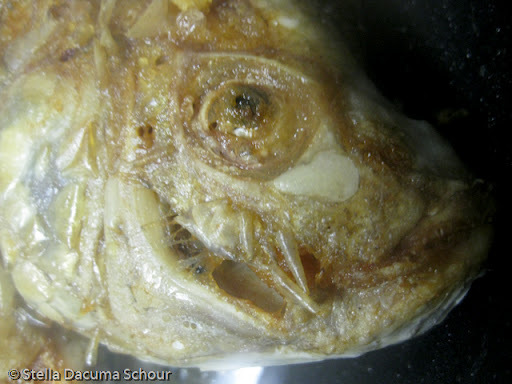 This is what is represented as fish bones in cartoons. Purple – On the main skeleton this runs on the vertical, if the fish is lying flat like this. This will intersect with the middle part of the blue skeleton. Expecting it to be there avoids accidentally swallowing the fish bone. 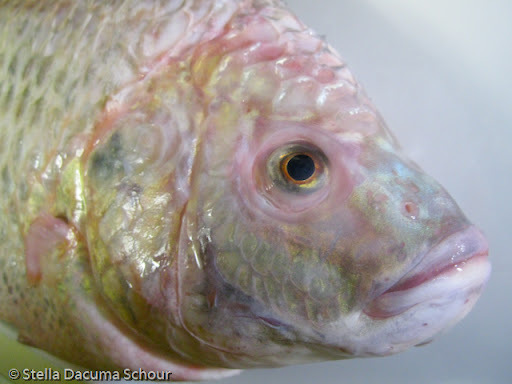 Yellow – this runs on the side of the fish. 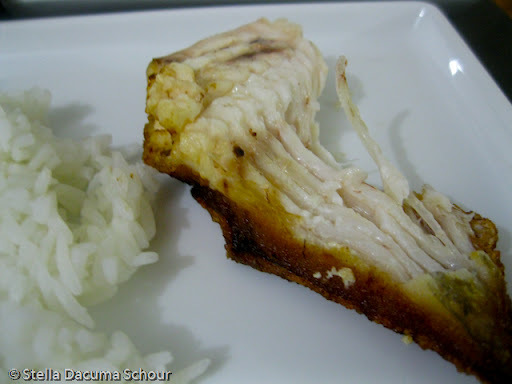 Green – this is the fish’s “ribcage” these are extra long bones and protects the guts of the fish. YOU CANT MISS THEM. Knowing where these bones will be will make your whole fish eating easier. 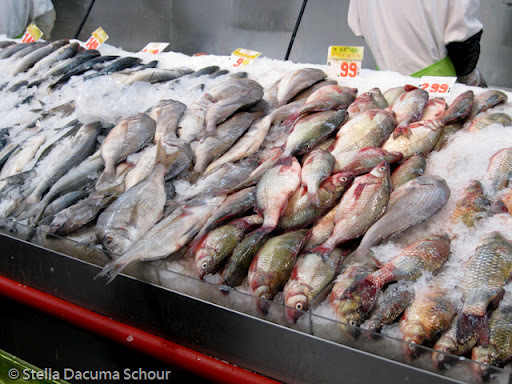 If this is your first time eating whole fish, DON’T WORRY ABOUT DOING IT WITH CUTLERY- EAT WITH YOUR HANDS! It takes practice to debone fish tableside. 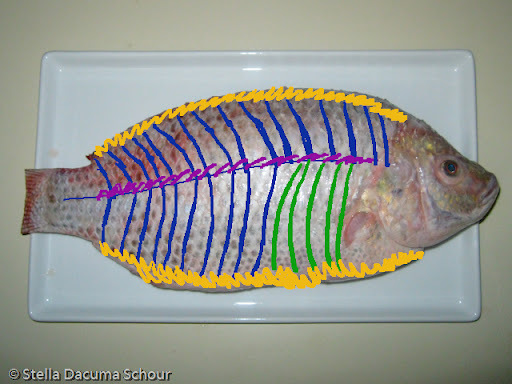 Learning about the fish’s anatomy will make it easier for you to navigate the whole fish that is usually on a buffet table. Fish head? Well, you can eat that too. My mom loves it. I am not a big fan. 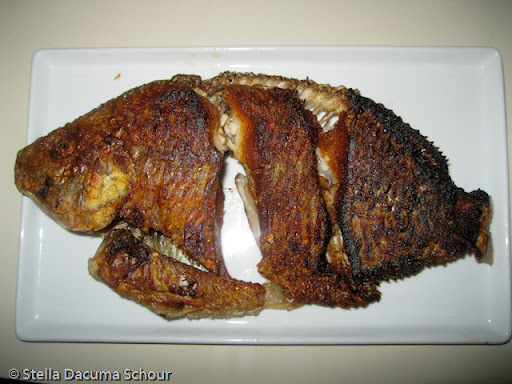 Eating tilapia that has been cooked as a whole generally has a better taste than a tilapia fillet. I still don’t understand fish sticks, and I will not buy deboned/filled fish unless it is a slice of salmon with the skin intact. I was waiting for this post and I am impressed! I love that you drew in color the bones of the fish. Makes total sense now. I also laughed a bit. You are a funny writer. And is the fish's name Grace? Fish Cheeks are so yummy! Make sure you eat it next time (that is, if you don't already)! The color-coded bones is GENIUS!! THANK YOU!!!!!! !